I’ll give that unnamed Bush staffer credit. * It is possible to create an alternate reality — if only for a time — given the willing complicity of all those watching (and transmitting) the useful fantasies of the powerful. Just look at the success the Koch brothers’ subsidiary political arm, aka the GOP et al. have had in persuading so many that wealth transfers to the rich are the solution to all ills. Hence the significance Bruce Bartlett’s entry today in The New York Times Economix Blog, in which the former Reagan, Bush I, Ron Paul and Jack Kemp policy advisor writes that, in essence, the entire Republican presidential field is lying about taxes to the American people. For years, Republicans have [said] …over and over again that taxes in the United States are exceptionally high and the primary obstacle to growth, and that a huge tax cut would do more to raise growth than any other policy. For example, former Gov. Tim Pawlenty of Minnesota, a candidate for the Republican presidential nomination, has proposed reducing the top statutory income tax rate on individuals to 25 percent and abolishing the taxation of interest, dividends and capital gains. The Tax Policy Center estimates that this plan would reduce federal revenues by $8 trillion over the next decade. Governor Pawlenty contends that unprecedented growth will result — to such an extent that there will actually be no revenue loss at all. I am not picking on Governor Pawlenty; all of the candidates for the Republican presidential nomination support similar policies, and not one has criticized him for making outlandish claims. Now this is, or ought to be obvious. The economic importance of statutory tax rates is blown far out of proportion by Republicans looking for ways to make taxes look high when they are quite low. And they almost never note that the statutory tax rate applies only to the last dollar earned or that the effective tax rate is substantially lower even for the richest taxpayers and largest corporations because of tax exclusions, deductions, credits and the 15 percent top rate on dividends and capital gains. The many adjustments to income permitted by the tax code, plus alternative tax rates on the largest sources of income of the wealthy, explain why the average federal income tax rate on the 400 richest people in America was 18.11 percent in 2008, according to the Internal Revenue Service, down from 26.38 percent when these data were first calculated in 1992. Among the top 400, 7.5 percent had an average tax rate of less than 10 percent, 25 percent paid between 10 and 15 percent, and 28 percent paid between 15 and 20 percent. The truth of the matter is that federal taxes in the United States are very low. There is no reason to believe that reducing them further will do anything to raise growth or reduce unemployment. Stephen Moore of The Wall Street Journal recently asserted that Democrats were trying to raise the top income tax rate to 62 percent from 35 percent. But most of the difference between these two rates is the payroll tax and state taxes that are already in existence. The rest consists largely of assuming tax increases that no one has formally proposed and that would be politically impossible to enact at the present time. Nevertheless, one routinely hears variations of the Moore argument from conservative commentators. By contrast, one almost never hears that total revenues are at their lowest level in two or three generations as a share of G.D.P. or that corporate tax revenues as a share of G.D.P. are the lowest among all major countries. A typical middle-class family, on the other hand, is paying less in federal taxes than it has since 1967. Its marginal rate is also down substantially since it peaked in 1982 at 31.7 percent. The well-to-do family, too, has seen its average and marginal tax rates decline substantially. Of course, these data do not prove that taxes are not too high. That is a subjective judgment related to issues of fairness and the value that people assign to the government benefits they receive in return. Many in the Tea Party talk as if the value of government is zero; consequently, they would probably complain about any tax level above zero. Nevertheless, it is clear that federal taxes have not been rising and are, at least in historical terms, lower for most taxpayers than they have been since the 1960s. That quote has had plenty of glosses, but let me appropriate it here to describe what Bartlett has just done. We have real numbers about taxes. We know what they are, and Bartlett in both of the cited posts provides handy historical references to allow any reader to trace the trajectory of those numbers. They are facts, chunks of experience quantified, and they have autonomy: Moore’s claim that a 35% rate is really a 62% rate is not a matter of interpretation; it’s just wrong. But, of course — as Moore’s sin illustrates — what we do with such numbers, the calculations we perform, the conclusions we draw from them, the interpretations we derive or force on them, why, all those are down to us. It’s no god’s nor FSM’s fault when we turn the actual knowledge we have into fashion accessories cloaking choices too ugly to pass unadorned. That’s what Bartlett, seemingly now irrevocably committed to the reality — or perhaps, better — the integer-based community, is actually saying here. To reiterate: a leading conservative policy thinker and economist has just demonstrated that the entire Republican presidential field is talking nonsense about fundamental economic policy. The implication couldn’t be more clear: if these views gain direct power over US policy, WASF, even more than usual. The question, which so far answers itself, is whether or not the media as a whole, and not just some (albeit prominent) blog-contributor, will pick up on this theme, and present the choice in 2012 as that between destructive fantasy and reality. I live in hope, but not in expectation. Those who assert that taxes are rising or are at confiscatory levels simply do not know what they are talking about. That may be true of some — but people like Pawlenty or Romney or Gingrich, any of them, really, have no such excuse. Pawlenty governed a state for two terms. Romney, we are told, is a smart money man. You get the point. They do know what they are talking about, and they choose to divorce themselves from the facts. These are not potential Presidents. *Said to be Karl Rove. 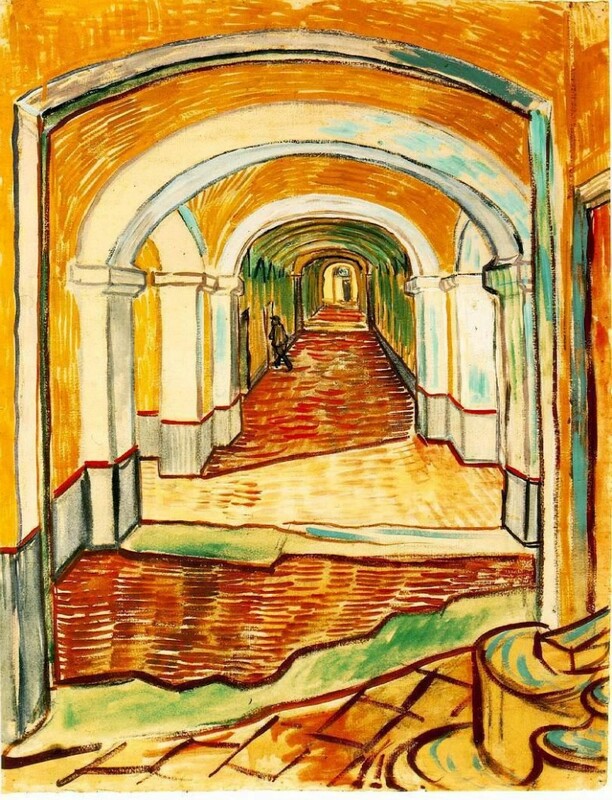 Images: Vincent van Gogh, The Corridor at the Asylum, 1889. 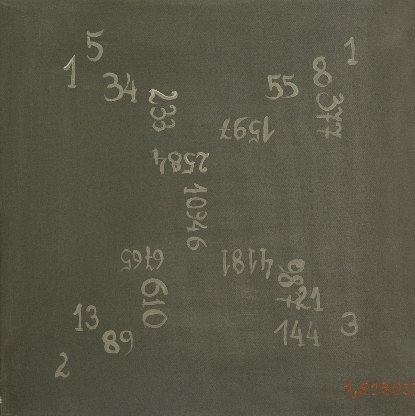 Martina Schettina, Fibonacci’s Dream, 2008.